Having tried out a few different techniques for glass fusing with ferns, and finalising the best, I have now moved on to the main reason for all this, the insert for the oak tray I am currently carving. 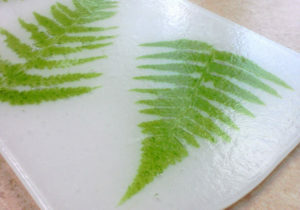 I started with 3 ferns coated with green glass powder. These were fused to a sheet of clear glass. With the carbon residue from the ferns themselves removed, this left the glass powder behind, reflecting the fern shape and form. Next the sheet was turned upside down and a sheet of opaque white glass put on top, as the background. This meant that what was to become the top surface was against the kiln plate. The reason I did it this was around was to give the top surface a textured finish to match the fern feel. The glossy, shiny top surface of the glass in then on the bottom and hidden. I have tried to show the silk surface texture in this picture. All I need to do now is complete the oak tray which this will be inserted into. 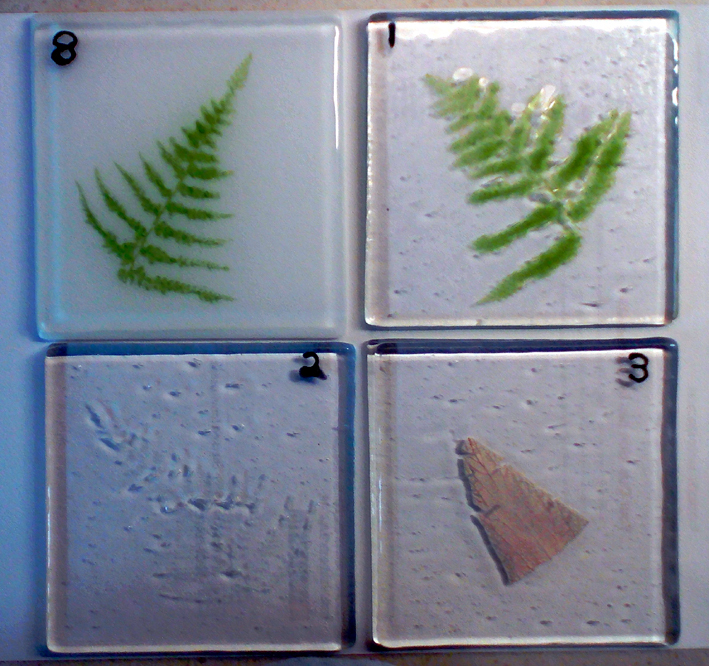 We had mixed results from the glass fusing with ferns. Good news is that two of the techniques worked really well, the other 7 didn’t. Without going into too much detail, unsuprisingly ferns by themselves turn to ash at glass melting temperatures. This can be used to create interesting fossil type effects as on 3 above, but at the risk of also creating large bubbles if you don’t use slow temperature ramps. If the fern is delicate then, as on sample 2 above, it is likely to completely disappear. 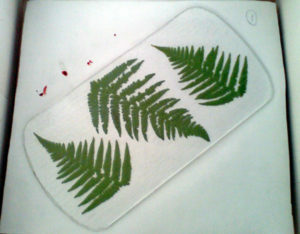 The key appears to be use glass powder stuck to the fern, as on 1 and 8 above, with a 2 stage process to reduce bubbles, as on 8. 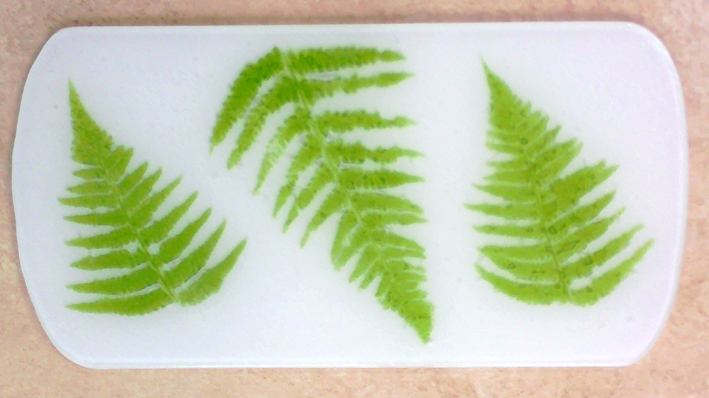 8 is therefore my method of choice to produce a fern in glass. Using this methodology, next comes the large piece I need for the oak carved tray I am making. I just have to hope that the method scales up.